Thanks to everyone who attended and performed at November 10th's relaunch edition of The Outer Church. Baron Mordant, Vindicatrix and DJ Kemper Norton all pulled blinders, and the term 'nematode feeding' is now firmly imprinted on my brain (to understand this you either had to be there, or alternatively you can purchase the Mordant Music MisinforMation DVD, available to pre-order from the MM site). 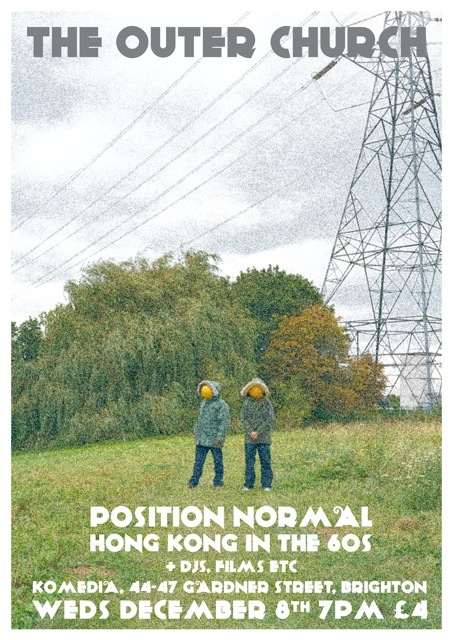 With barely a pause for breath, it's my pleasure to announce that the December 8th edition will witness the return of Position Normal (whose set a few months back at the Penthouse was so tremendous, I decided to invite him back for more) and the OC debut of London/Cambridge beauties and stars of the Ghost Box 7" Study Series, Hong Kong In The 60s (whose fantastic new EP you can download for free here). In addition, there will be filmic curiosities and perhaps the odd bit of spinning from myself and the marvellous Kemper Norton, whose DJ set last time was a thing of macabre beauty. Incidentally, you can download a brand new Kemper Norton EP, again for free, here. I'll be covering my adventures at Krakow's Unsound Festival 2010 in the pages of The Wire, but just wanted to give a heads up regarding the video artist Jade Boyd, who accompanied the terrific live set from soundtrack maestro Alan Howarth. Although the performance was intriguing partly because it foregrounded Howarth's film music, the visuals were far from ignorable, working as a fitting tribute to the cinematic sources, primarily the films of John Carpenter, including Prince Of Darkness, They Live, Escape From New York and Halloween III: The Season Of The Witch (which I believe to have inspired Carpenter and Howarth's finest score). I found Howarth and Boyd's collaboration curiously moving; I was reminded just how significant a part of my own cultural life these films and this music are, the manner in which certain sounds and images have entered into a highly personal dream catalogue. Definitely a highlight of the festival. Above is a clip showing some of Boyd's live visuals for Kyle Hall's DJ set in the Fabrika venue, also at Unsound. Look, just listen to it, okay?